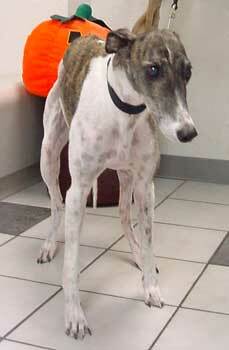 Lucy is a tiny, 10-year-old, white-and-brindle female, born August 1992. 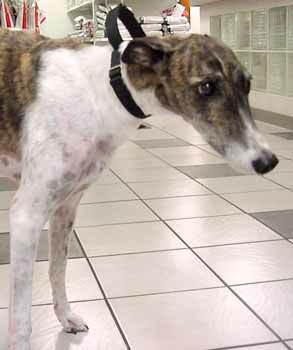 She has never raced, and has spent her life as a companion pet. Lucy was given up because of her age and the arrival of a new baby. She is small animal and cat friendly, and is a sweet loving little girl weighing under 50 pounds. Lucy needs a forever home to spend the rest of her life. It is hard to believe this sweet little girl is 10 years old. Lucy is ready to go outside and play with the rest of the gang (foster Greyhound brother and foster Westie sister) as soon as she hears the word "out". Lucy has adapted quickly to her new environment and seems to be right at home and very relaxed. Lucy is so loving, when she wants some attention she comes over and puts her head in your lap and will stay there as long as you are willing to rub her head. All she asks for is a comfortable place to lay and in return she will love you forever.